What makes us different? It's our service & quality! We sell only the best U.S. made products. We want to become your supplier of flags, banners, and pennants. If you order today we will try our best to ship today. If you need help deciding what you want, we will be glad to help figure it out. If you are not happy with what you get we will refund your money, no questions asked (just as long as it is not used). 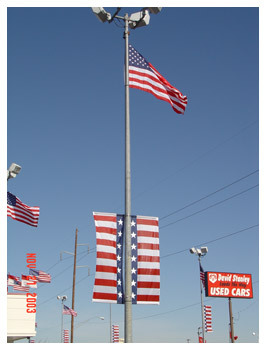 We look forward to becoming your "flag shop".